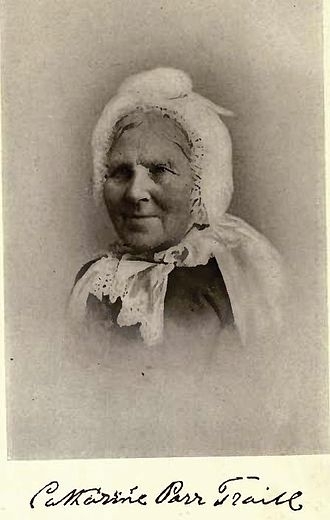 She was born Catharine Parr Strickland in Rotherhithe in 1802, sister to authors Agnes Strickland, Jane Margaret Strickland, Susanna Moodie, and Elisabeth Strickland. She was the first of the sisters to commence writing. She began writing children's books in 1818, after the death of her father. Her early work, such as Disobedience, or Mind What Mama Says (1819), and "Happy Because Good", were written for children, and often dwell on the benefits of obedience to one's parents. She described her new life in letters and journals, and collected these into The Backwoods of Canada (1836), which continues to be read as an important source of information about early Canada. She describes everyday life in the community, the relationship between Canadians, Americans, and natives, the climate, and local flora and fauna. More observations were included in a novel, Canadian Crusoes (1851). She also collected information concerning the skills necessary for a new settler, published in The Female Emigrant's Guide (1854), later retitled The Canadian Settler's Guide. She wrote "Pearls and Pebbles" and "Cot and Cradle Stories". After suffering through the depression of 1836, her husband Thomas joined the militia in 1837 to fight against the Upper Canada Rebellion. In 1840, dissatisfied with life in "the backwoods", the Traills and the Moodies both moved to the city of Belleville. While Susanna was more concerned with the differences between rural and urban life, Catharine spent her years in Belleville writing about the natural environment. She often sketched the plant life of Upper Canada, publishing Canadian Wild Flowers (1865), Studies of Plant Life in Canada (1885) and "Rambles in the Canadian Forest". Epub 20090409.epub If you cannot open a .mobi file on your mobile device, please use .epub with an appropriate eReader. Mobi/Kindle 20090409.mobi Not all Kindles or Kindle apps open all .mobi files.